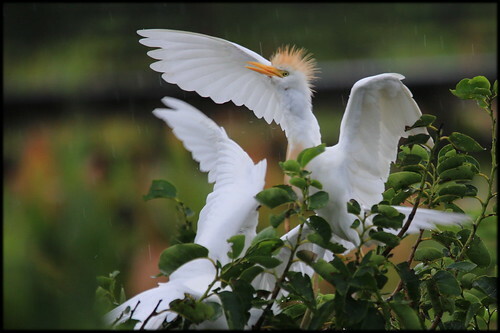 This time of the year the Cattle Egret, a member of the Heron family, propagation is well underway. 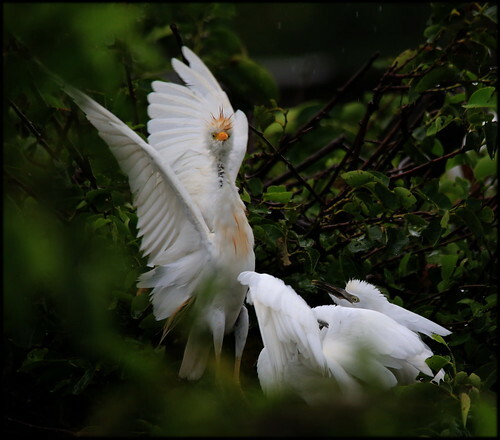 As Jo, my wife, and I explore the wilds of Florida we are noticing what appears to be an up swing in the Cattle Egret population in may areas we visit. 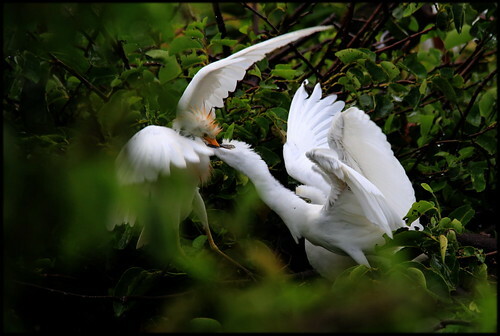 These Ibis like birds, without the long curve bills, are called Cattle Egrets because they have in interesting relationship with, well, cattle. When you see these Egrets in the field with cows you correctly think they are enjoying the bugs and insects the transportation on which they are mounted kicks up. But they go one step further and not only help keep insects away from their symbiotic partner by feeding on the insects but they also pluck tics and other parasites from the skin of their bovine chauffeur. 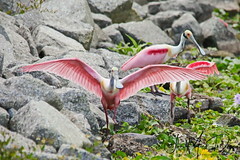 In may other countries these Egrets can be photographed hitching rides on Elephants, Hippos, Water Buffalo, Oxen, and other large mammals, including sleeping Mexicans at siesta time. 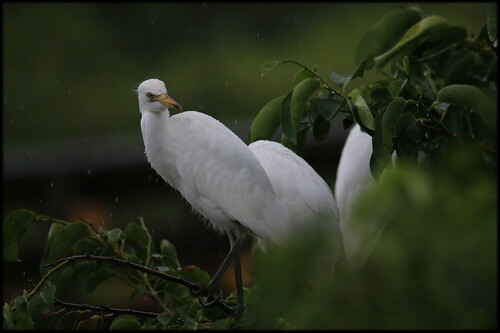 This photo sequence was captured during a hard rainstorm in the rookery at Wakodahatchee Wetlands in Palm Beach County, FL. This illustrates how hearty these birds can be. 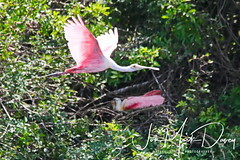 The first shot is a mother Egret preparing to feed her chicks. If you click the pictures they will open in Flickr where you can explore the larger versions. 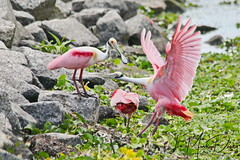 Sometimes the mom Egret will rise, shuffle the food in her crop, and continue the feeding ballet, although some call it sword fight. At feeding time the chicks are very aggressive and want food NOW! If humans fed our babies like this there would probably be no kids to feed. 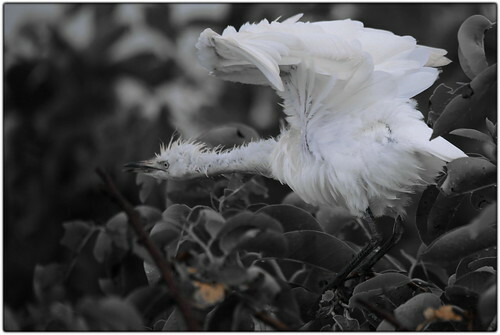 This shot is of a young, newly fledged Egret waiting to fly to the shore and forage for food. 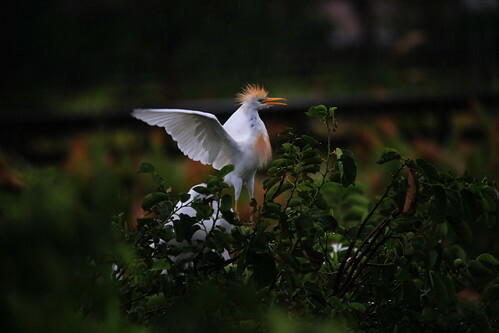 At some point all the rain can be more than a Juvenile Cattle Egret can bear and he turns into the family dog with wings to dispel the water. 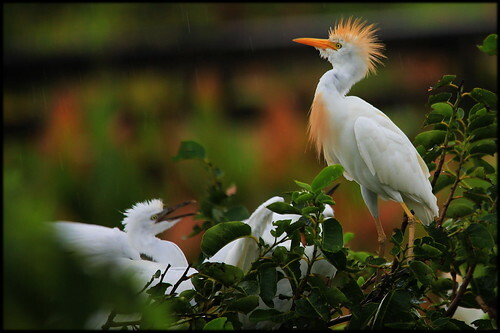 The Egrets are beautiful birds, especially in full breeding plumage. 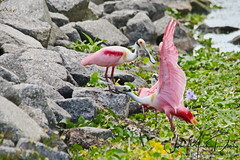 They are great to watch both in the wild and in the rookery. Great photos and information. Thank you. I love ur pictures of nature, they r gorgeous. I am curious what type of camera do u use??? 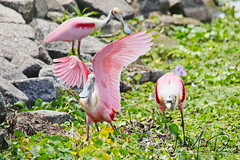 I love taking nature pictures here in Sarasota but looking for a new camera, have a Pentax and it doesn’t take very good pictures. Migrating from the Pentax to the Canon SX would give you some really good shots once you learn how to use the X, it’s different than shooting with a regular DSLR. I hope that helps.